Disclaimer: I received a bottle of Win Detergent to review as part of being a BibRave Pro. Learn more about becoming a BibRave Pro (ambassador), and check out BibRave.com to review, find, and write race reviews! Especially smelly workout and running gear after it’s been sitting for a few days. No way around it, it needs to be done. Yes, it would probably not be as bad if I washed my running gear right away, but who has time to laundry every day? Nope, not me! So I deal with it. As long as my clothes come clean and don’t smell AFTER I wash them, I’m ok! The synthetic fabrics that our workout/running gear is usually made from is designed with properties that will help it to repel water (i.e. wick the sweat away) but these properties also mean that the fabric is absorbing oils. This oil is what ends up causing our clothes to stink. Unfortunately, we often find that our workout gear still has an odor to it after we wash it, because the oils are trapped and regular detergents don’t get it out. Different types of clothes need different kind of detergent. What works on your every day clothes is not going to work on your synthetic fabrics. 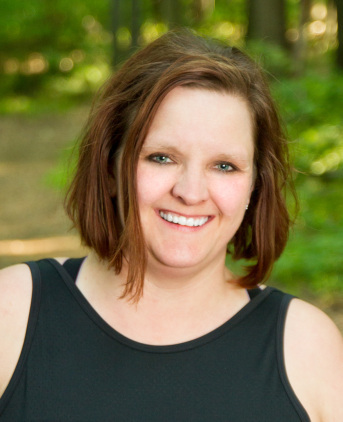 Yes, that every day stuff is going to help to get the ketchup and mud out of your kids clothing, but it’s not working to get the oils out of your workout gear! 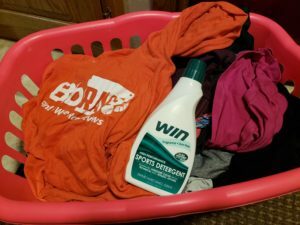 Since I started using the WIN detergent, I have noticed that my workout/running gear comes out just as clean – and is also lacking the odor!! If you don’t want to wait, head to Win and check them out RAVE4WIN to get 20% off any WIN purchase (individual bottle, 2-pack, or 4-pack.) Offer good through 1/15/2019. Limit one use per household.. Also check out Win on Instagram, Twitter and Facebook!